Watch an on-demand webcast of the MSRB’s free education and outreach seminar on the evolution and emerging trends of the municipal market for industry professionals, co-hosted by the Municipal Forum of New York in July 2015. Kevyn D. Orr, former emergency manager for the city of Detroit, delivered the keynote address. View a recording of the event. Sign up here to receive email updates about the pilot municipal advisor exam and tips for preparing. The MSRB has announced the dates for its pilot Municipal Advisor Representative Qualification Examination (Series 50)—the test that is the precursor to the permanent qualification exam for municipal advisors. The Series 50 pilot exam will be offered January 15, 2016 – February 15, 2016. The exam serves as a qualifying test for municipal advisors under MSRB Rule G-3, which requires every municipal advisor representative to take and pass the Series 50 prior to being qualified as a municipal advisor representative. Any individual engaged in municipal advisory activities on behalf of an MSRB-registered municipal advisor is permitted to take the pilot Series 50. Candidates who take and pass the pilot Series 50 will be qualified as a municipal advisor representative and will not be required to take the permanent qualification examination. The next step for municipal advisors interested in taking the pilot exam will be the opening of the enrollment window on September 21, 2015. The MSRB will provide more information about the enrollment process soon. Additional details and resources for pilot participants are provided below. The Securities and Exchange Commission (SEC) recently ordered the MSRB’s proposed rule to establish core standards of conduct for municipal advisors into an additional phase of the rulemaking process. The SEC invited additional comment from interested parties on the proposed rule by September 11, 2015. 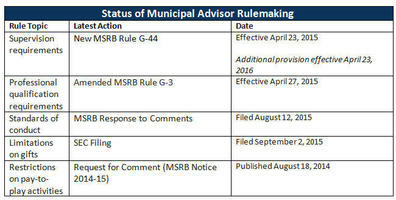 Proposed Rule G-42, which the MSRB filed with the SEC for approval in April 2015, is designed to serve as the cornerstone of the MSRB’s developing regulatory framework for municipal advisors. The MSRB submitted a letter to the SEC responding to issues raised by commenters about the proposed rule. The MSRB also filed several minor amendments primarily to clarify the text of the proposed rule. View the amended rule language. On September 2, 2015, the MSRB asked the SEC to apply to municipal advisors the limitations on business-related gift-giving that currently apply to municipal securities dealers. The proposed amendments to MSRB Rule G-20 aim to address conflicts of interest that may arise from the giving of gifts or gratuities in connection with municipal advisory activities. The proposed amendments, which would be effective six months after SEC approval, also add a new provision to specifically prohibit both dealers and municipal advisors from seeking reimbursement for certain entertainment expenses from the proceeds of an offering of municipal securities. In addition, the MSRB is seeking to extend to municipal advisors related books and records requirements through proposed amendments to MSRB Rule G-8. Read the rule filing. 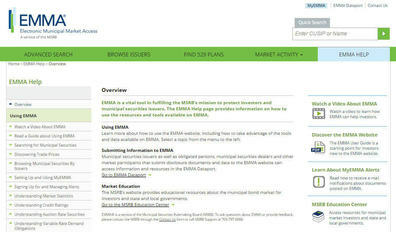 The MSRB operates the EMMA website as a free transparency resource for all municipal market participants. To get started on EMMA or learn more, visit the EMMA Help section of the website, which contains useful tutorials and tips for navigating EMMA, creating customized MyEMMA user accounts and for understanding information on the website.